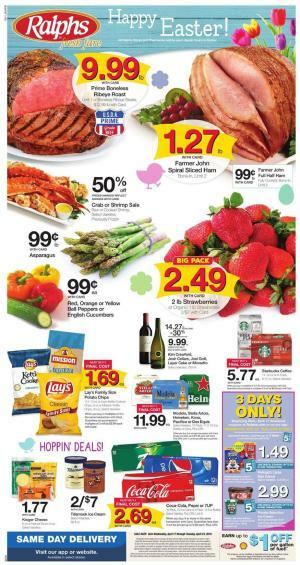 Fresh food and low prices are here for you with Ralphs Weekly Ad Deals Jan 9 - 15, 2019. If you buy 1 of Jennie-O lean or seasoned ground turkey, you can get 1 of equal or lesser value for free and save up to $5.99 lb with card. In addition, fresh strawberries, avocados, mangos and oranges are for great prices this week. Check out page 2 and 3 for BOGO sale! Prices are good until Jan 15. Oscar Mayer Wieners, Breyers Ice Cream, Kroger or Private Selection K-cups, Boneless pork tenderloin are the best deals of BOGO sale. Save $12 instantly on groceries with the purchase of any 6 750 ml wines and $40 minimum grocery purchase with rewards card. You can find Toasted Head, Robert Mondavi, Private Selection, Clus do Bols, Sauza Hornitos and much more alcoholic beverage options for fantastic prices. 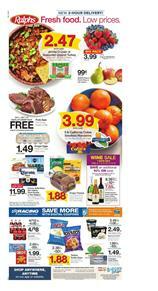 Check out page 5 for snacks and easy to prepare foods. These are great for you if you work at the office. You can find great lunch sandwich ideas. If you prefer to add some healthy choice to your diet, check page 6 for meat, fresh fruits and vegetables. Ralph give importance to vegan and vegetarian products so there are several plant based options on page 7 for you such as Simple Truth frozen almond desert, organic tofu, plant based milk etc. Finally, don't forget to take a look at page 8 to see the offers that bring you earn 3x fuel points. It's a good idea to stock up from household items and earn more points.